This historic town in the north of Thailand is known for its quaint streets and horse-drawn carriages. Travelers use this quiet area on the bank of the Wang River as a convenient jumping-off point for trips throughout the region, but it’s also worth exploring in its own right thanks to its excellent markets, restaurants, cafés, and attractions. A center for the teak trade during the 19th century, Lampang has become one of Northern Thailand’s hidden gems and a favorite among travelers looking to get off the beaten track. 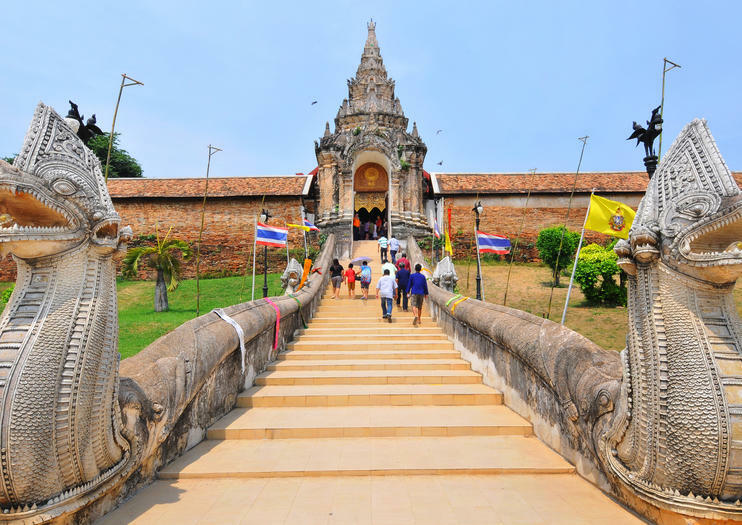 Lampang is also a popular day trip destination from Chiang Mai; travelers pressed for time can opt for a day trip to see highlights such as the Thai Elephant Conservation Center, Wat Phra That Lampang Luang temple (and its traditional Lanna architecture), and the Gad Gong Tha weekend night market. Those with more time to explore Northern Thailand can join a multi-day cultural tour, with stops in Lampang, Ayutthaya, Chiang Mai, and Chiang Rai. Lampang is a must-visit for adventure travelers and those looking for an off-the-beaten-path experience. Lampang has no tuk-tuks, so you’ll need to take either horse-drawn carriages or the green and yellow songthaews (truck taxis) to get around. Lampang day trips from Chiang Mai typically take upwards of eight hours, depending on what’s included. Lampang is accessible via the northern railway line between Bangkok and Chiang Mai. The trip can take upwards of 12 hours from Bangkok or two hours from Chiang Mai. Several buses make the trip from Arcade bus station in Chiang Mai to the town, a journey that takes about 90 minutes. The best time to explore Lampang and its surroundings is between November and February, when temperatures are cooler and rain less likely. Temperatures can top 100℉ (38℃) in April, May, and June. September tends to be the rainiest month. Lampang Province is best-known for its ceramics made from china clay, but there are plenty of other local handcrafted goods to keep an eye out for when you’re in town. Traditional Thai silks and colorful mulberry paper also make excellent gifts or souvenirs. Dompel jezelf onder in de Thaise cultuur en ontdek de rijke geschiedenis en het rijke erfgoed van Thailand tijdens deze epische 7-daagse tour vanuit Bangkok. Ontdek de door UNESCO beschermde steden Ayutthaya en Sukhothai; rijd een riksja rond de tempels en markten van Chiang Mai; een duurzaam olifantenkamp bezoeken; en verken de heuvel-stam dorpen rond Chiang Rai. Hotel pick-up, accommodatie en maaltijden zijn inbegrepen. Ervaar de breedte van de geschiedenis, cultuur en ambachten van Noord-Thailand tijdens een 12-uur durende privétour van Chiang Mai naar Lamphun en de provincie Lampang voor maximaal 9 personen. Geniet van de flexibiliteit om de dag aan uw interesses aan te passen, zoals het verkennen van Lanna-achtige tempels, een historische binnenstad en een keramiekfabriek, met een persoonlijke gids en vervoer van deur tot deur.